Can we increase creative performance through the training of specific brain dynamics? The present article describes an innovative neurofeedback training (NFT) procedure aimed at increasing creative cognition through the enhancement of specific brain activities previously associated with divergent thinking. 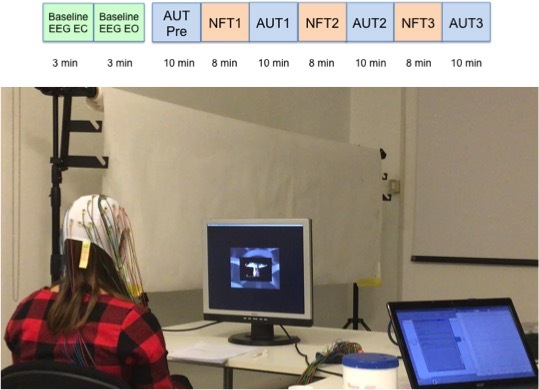 We designed and tested two NFT protocols based on training alpha and beta EEG oscillations selectively measured over the right parietal region. A total of 80 participants were involved, 40 in the alpha NFT protocol and 40 in the beta NFT protocol. The NFT loop was closed on a video stream that would advance only when oscillation power exceeded a normalized threshold. The total duration of the protocol was two hours in a single day, hence its classification as rapid. Changes in ideational fluency and originality, measured with a divergent thinking task, were compared between participants receiving real video feedback and participants receiving sham feedback. We controlled for individual differences in creative achievement level. Results showed that the protocols were effective at enhancing alpha and beta activities in the targeted area. Differences between the two protocols emerged in their effectiveness at promoting divergent thinking. While no significant changes in originality re- sulted from the rapid alpha NFT, increases in both originality and fluency emerged as a consequence of the rapid beta NFT. These results were particularly evident in participants starting with a low creative achievement level. Possible interpretations and future directions are proposed and discussed. Agnoli, S., Zanon, M., Mastria, S., Avenanti, A., & Corazza, G. E. (2018). Enhancing creative cognition with a rapid right-parietal neurofeedback procedure. Neuropsychologia. Even if mind wandering (MW) and mindfulness have traditionally been intended as separate and antithetical constructs, the roles of these 2 mental states on creative behavior were jointly explored in this article. In particular, MW was analyzed in light of a recent approach suggesting a differentiation between deliberate and spontaneous MW, whereas mindfulness was analyzed by distinguishing its 5 different constitutional dimensions: observing, acting with awareness, describ- ing, nonreactivity, and nonjudging. The influence on creativity of these 2 mental states was analyzed using a sample of 77 undergraduate students both on a performance index (i.e., originality) and on a self-report index (i.e., creative achievement). Results showed that MW and mindfulness dimensions predicted creative behavior both alone and in combination, suggesting a complex interdependence between these 2 mental states within the creative thinking process. In particular, the critical importance of distinguishing between deliberate and spontaneous MW was revealed by a final path analysis, which revealed the opposite effects of these 2 dimensions on originality and creative achievement. That is, deliberate MW positively predicted creative perfor- mance, whereas spontaneous MW was negatively associated with such performance. Moreover, the nonreactivity and awareness dimensions of mindfulness, the latter in interaction with deliber- ate MW, emerged as main predictors of response originality. Finally, the describing facet of mindfulness predicted creative achievement both directly and indirectly through an interaction with deliberate MW. The implications emerging from the adoption of a multi-dimensional approach to the analysis of MW and mindfulness in the study of creativity are discussed herein. Agnoli, S., Vannucci, M., Pelagatti, C. & Corazza, G.E. (2018). Exploring the Link Between Mind Wandering, Mindfulness, and Creativity: A Multidimensional Approach. Creativity Research Journal, 30(1), 41-53.